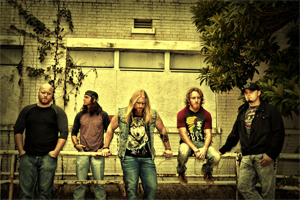 BLACKTOP MOJO Releases AEROSMITH Cover Video For "Dream On"
Modern Southern Hard Rock Band BLACKTOP MOJO has released the Official Music Video for their cover of aerosmith's classic hit "Dream On". The video was filmed by Nolan Cox of Nolan Taylor Media in Palestine, TX at Audioworx Studio. The track, which was produced by Philip Mosley and mixed by Austin Deptula at Rosewood Studios, comes from the band's upcoming sophomore album Burn The Ships which is set to release in early 2017. After running the highways for two years in support of their debut album, I Am (2014), in July of this year the band loaded their gear in the van and made a trip to Sound Emporium Studios in Nashville, as well as FAME Studios in Muscle Shoals, AL to make their sophomore effort entitled, Burn The Ships. In addition to the producer of the band’s first record, Philip Mosley, the band brought in co-producer Jimmy Johnson of the legendary Muscle Shoals Sound Studios as well as his long time engineer Steve Melton to bring a seasoned sonic quality to their brand of raw, grungy rock. Burn The Ships is slated for release in early 2017.